It was a typical Monday night. I was walking with a patient with a hip disarticulation and we were working on stepping over obstacles. Everything was going swimmingly, and my patient was demonstrating some really advanced skills. On the last trial, he stepped a little too far, lost his balance, and was going to fall. I immediately sprang into action and jumped, spreading my feet to get in a good position to catch him. The only problem was, instead of landing flat on my feet, my right foot turned in a bit and I landed directly on the side. This, as it turns out, is a great way to fracture a metatarsal, which was later confirmed via x-ray the next day. And in a Murphy’s Law-esque turn of events, I fractured the proximal portion of my 5th metatarsal, which is also known as a Jones fracture. This is the first time I have ever had any injury, and as a physical therapist, it has changed my perspective on the patient experience. Here are a few of the lessons I have learned from the other side. The first lesson I learned was the importance of building a therapeutic alliance with your patients. As a new graduate, it is easy to get overwhelmed with new bosses, a huge caseload, and learning the ins and outs of your new professional life. Patients become names on a list; body parts to treat, obstacles to the end of your day. After I fractured my foot, I went to an urgent care clinic, and then later an orthopedist. I encountered many healthcare professionals that didn’t introduce themselves. Some of my doctor visits lasted for about 5 minutes, not counting the time I was being x-rayed. I wasn’t given time for questions and my doctors did not take the time to get to know me or understand the concerns that I had. When I did have questions, it was difficult to get in touch with the doctor and there was always a delay in getting the answers I needed. There is research to back this up too. In a research study by Ferreira et.al., the authors assessed the relationship between therapeutic alliance, as measured on the Working Alliance Theory of Change Inventory, and outcomes for patients being treated for low back pain. The authors found that strong therapeutic alliances were associated with better clinical outcomes. In another study by Fuentes et.al., the authors divided a group of patients with chronic low back pain into four groups: active IFC treatment with a limited therapeutic alliance, active IFC treatment with an enhanced therapeutic alliance, and then two similar groups with sham IFC treatment. The patients in the enhanced therapeutic alliance group reported more pain relief than those in the limited therapeutic alliance group. The second lesson I learned was about the importance of setting reasonable expectations for patients and explaining the role of uncertainty in medicine. A fifth metatarsal fracture is associated with a certain level of medical trickiness that is not seen as often with other fractures, which has resulted in some frustration on my end. At 5 weeks, 9 weeks, and 13 weeks in, I thought my fracture would have been healed and I would be back to normal. Maybe go for a run after my (what I thought to be) the last check-up. But things did not go as planned. I am still wearing a CAM boot, and I don’t know what to tell my patients when they ask how much longer I am going to be in it. The reality is that despite our best efforts, precision in diagnosis, prognosis, and treatment is not always possible. Communicating that reality to patients right away helps them understand their situation and make the best possible decisions. Here is the “bio” part: I was diagnosed with a simple, non-displaced, and relatively small fracture in one bone of my right foot. The psychosocial implications, however, far outweigh the “bio” ones. For the first 2 weeks I was non-weight bearing and on crutches, limiting my ability to do pretty much everything. This included working, getting into my second-floor apartment, helping with chores, driving, and even just getting to the bathroom. I was essentially homebound, which was quite the contrast from the active life I was living. Things got easier after I was able to ditch the crutches, but I still have my problems. I will be getting married at the end of July, and going to Hawaii for our honeymoon. And unfortunately, there is a possibility that my CAM boot will be making the trip to Hawaii with us. As close as I have gotten to my beloved CAM boot, I really don’t want to be thinking about it on my wedding day. As annoyed and upset as I was throughout this process, the psychosocial aspects of my problem, though significant, are petty. The patients we work with may have much more extensive injuries and as a result, their lives will be much more dramatically affected. It is hard to be upset about having to wear a CAM boot all the time, when I regularly treat patients with bilateral below knee amputations that are wheelchair bound. It is so easy to see patients as body parts to treat, but we have to be able to empathize with what they are going through on a biological, psychological, and social level. You immediately see an injury, but the injury will mean so much more to them. They may not be able to walk into their child’s graduation ceremony that is in a month. It may mean they will never be able to stand again. It may mean that they can’t run in a race they were training for all year. They may have to delay their vacation because they need a surgery. Maybe they won’t be able to work and provide for their family. It could limit their ability to care for a dying family member. Or it may mean they have constant pain and can’t participate in all the normal things kids their age do. 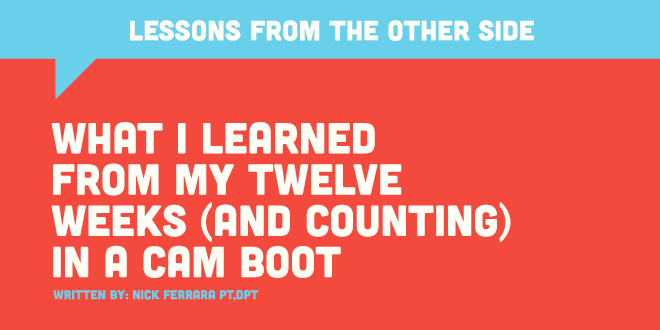 The ongoing experience I am having with my broken foot has taught me a few things that I could not really get from school or even my direct patient care experience. And while a significant percentage of those reading this have probably gone through similar injuries, I am sure that an equally significant percentage have not. So here are some tips I have picked up from being on the other side of the health care system. Patients will value the simple things; introducing yourself, talking to them about their daily life, and just treating them as a human being instead of a time slot on your schedule. If you truly value your patients’ success, and I presume you do, then you should understand that success in their eyes is defined by being able to do meaningful tasks, like being able to walk down the aisle without a CAM boot that doesn’t match their outfit. Learn what is truly important to your patients as soon as possible, and tailor everything towards that. When preparing for an evaluation, it may be difficult to plan out all of the tasks you need to get through. I have seen a few student physical therapists perform evaluations where they read questions off of a list, go one by one through different assessments, and not engage with the person sitting in front of them. It is easy to only worry about making sure you get all the information you need and not build a connection. Be open and clear with your communication. My doctor left many things up for interpretation and some recommendations were unclear, which resulted in many frustrating moments for me. It was extremely difficult to get in touch with my doctor to clarify things. Make sure that you leave time for patients to ask you questions, and give them a business card with your direct contact information so they have a way of talking to you. At my office, my bosses have encouraged us to follow up with our initial evaluations over the phone the next day just to check in and make sure everything went well the first day. Almost unanimously, my patients are 1) surprised to have gotten a call, and 2) grateful and appreciative. As a new graduate, it may mean you have to stay a few minutes late after a long shift when you have a few hours of documentation to do, but patients will absolutely appreciate you going the extra mile. Provide realistic information with an appreciation for a certain level of uncertainty and imprecision associated with medicine. Building up your confidence as a new graduate takes some time, especially immediately after you are out of school. You don’t want to seem like you don’t know something. However, sometimes it is nearly impossible to know the answers to some of the most common questions: When am I going to get better? Why did this happen? Understand the psychological and sociological implications an injury will have. Having an appreciation for how an injury or condition will affect the patient outside of the clinic will help you empathize with them and help to tailor your treatments to the things that really matter to them. Immediately after graduating physical therapy school, it can be an overwhelming experience. There are too many day-to-day things to worry about like getting your documentation done on time, maintaining your productivity, impressing your bosses, developing your clinical skills...the list will go on. But it will be of great benefit to you and your patients if you can take a step back from these practical concerns and take a look at the bigger picture. You are in the healthcare field to improve the quality of life of others. This starts by being a good person and treating others with kindness, compassion, and empathy. This should be your primary concern. In the past few months, I have learned how an injury can affect all aspects of a person’s life and what I would want from a healthcare practitioner involved in my care. I hope the lessons I have learned will help you too. Ferreira PH, Ferreira ML, Maher CG, et al. The therapeutic alliance between clinicians and patients predicts outcome in chronic low back pain. Phys Ther. 2013;93: 470–478. Louw, A., & Puentedura, E. (2013). Therapeutic Neuroscience Education: Teaching Patients About Pain: A Guide For Clinicians. Story City, IA: International Spine and Pain Institute.